Hourglass is in. Whether you’re flipping channels or perusing through a magazine, beautiful curvy women are everywhere--Kim Kardashian, Kate Winslet, Salma Hayek... need I go on? These ladies know how to fill out a dress. Yes, they’re celebrities. Sure, they have personal trainers. Yeah, I know, they probably still own a pair of Spanx. However, there’s no reason that you can’t have the same dynamite hips, slim waist, and rockin’ booty as these stars. How, you ask? Start working out specifically for your body type. If you have an hourglass body type you should focus on exercises that work your outer thighs and help lean out your waistline. Cardio is very important for this type of figure, so you’ll want to do moves that keep your heart rate elevated. Using medicine balls can also be helpful as they work your upper body, while engaging your core. Try this curvy body workout, moving as quickly as you can on the timed exercises and going for a high number of reps on the others. Give ScarJo a run for her money! 1. Pushups. Lie face down with your legs straight out behind you and your feet together. Position your palms so they are directly under your elbows. When your arms are bent, they should form a 90-degree angle. Your neck should be straight and your eyes should be focused on the floor in front of you. Keep your abs tight. Straighten your arms so that your body is hovering over the floor, balancing on your palms and the balls of your feet. Now, bend elbows and lower your entire body at once until your upper arms are parallel to the floor, exhale, then push back up to the starting position. If you are a beginner, try doing an incline pushup by placing your hands up on a step. Repeat for 20 reps or more if you are able. 2. Knee Drive with Medicine Ball. Start by standing in a diagonal lunge-like position. Your straight leg should be behind you with your heel lifted. Hold a medicine ball in your hands, and start with your arms overhead on a diagonal, as well. From here, swing the ball down toward your knee, rotating your torso. Bring the ball back up and repeat. Do these drives for 30 seconds on each side for a total of 3 rounds. 3. Side Step Ups. Facing the left side of your body to a stair, step up onto the stair with your left foot while lifting your right leg out to the side. Lower your right foot back to the ground, and repeat. Do 20 reps on each leg or more if you are up for a challenge! 4. Medicine Ball Squat Throw. 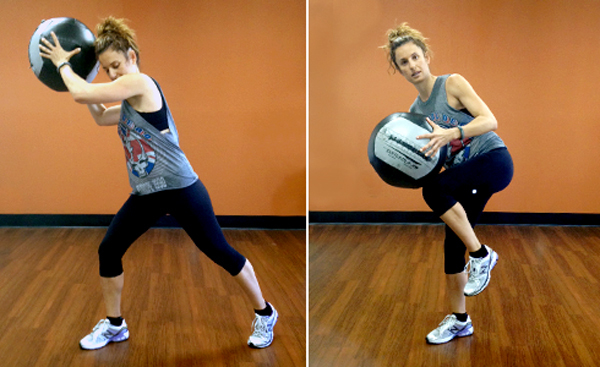 Stand facing a wall with your feet shoulder-width apart, holding a medicine ball. Lower into a squat, tracking your knees over your toes until your legs are at a 90-degree angle. As you push back up into standing position, throw the medicine ball against the wall and catch it as it rebounds. Remember to engage your abs. Repeat this exercise for 30 seconds. This move will work your full body and is great cardio, as well. Don’t have a curvy figure? Check back next week for more body type workouts. In the meantime, try A Head to Toe Workout with Just One Move!